CCYLA and CCBA are shining a light on mental health. FREE CLE CREDIT & LUNCH for CCBA MEMBERS & NON-MEMBERS. 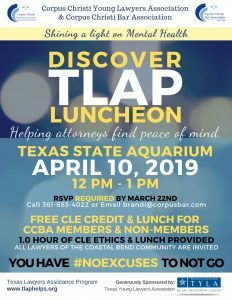 1.0 Hr of CLE Ethics & Lunch provided. ALL LAWYERS of the Coastal Bend community are invited. We currently don’t have attorney referrals for HOA or Landlord/Tenant cases.